amazing dipping sauces to round out your visit to Cane’s. I’m going to have to give a shout-out to my friend Sara Hebert for this hidden gem menu item. 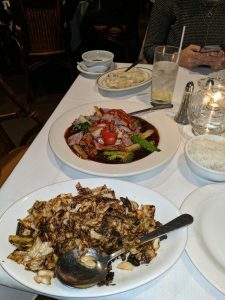 On a dinner date, she told me I had to try the burnt cabbage at Lucky Palace Chinese Restaurant. Now, I like cabbage just as much as the next person, but I could tell from the expression on her face that there was *something* special about this cabbage. It was sweet, salty and caramelized to perfection. Some parts of the sautéed cabbage were crisp and some parts were tender. Every time I go to Lucky Palace, I HAVE to get burnt cabbage. There just isn’t any way I could pass it up now. The reason this dish is so hard to spot is because on the menu it is just called “sautéed cabbage.” However, if you just order burnt cabbage, then the waiter will know exactly what you’re talking about. Ordering it is going to be one of the best decisions you’ll ever make. every single time I go. It’s true that Kabuki Sushi & Roll itself is quite the hidden gem in town. Not a lot of people have ventured over there because they’ve never heard of the place. However, when people do make a trip over to Kabuki they usually find themselves drawn in by all the amazing sushi options. They have every roll there that you can think of—and even some that you probably have never thought of. 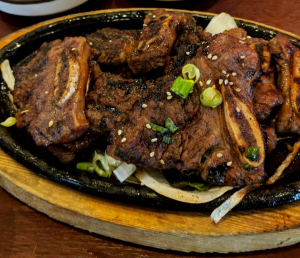 But there is one hidden gem on their menu that most people won’t think to order and that is the Korean BBQ short ribs (galbi on the menu). These succulent short ribs are marinated and then grilled to perfection. They come served up on a sizzling hot plate on top of a bed of caramelized onions. The dish is the perfect marriage of sweet and savory. So if you ever make a trip out to Kabuki, you should take a chance on their short ribs. some of your new favorites! Previous Post:What do Adults do for Fun in Bossier?